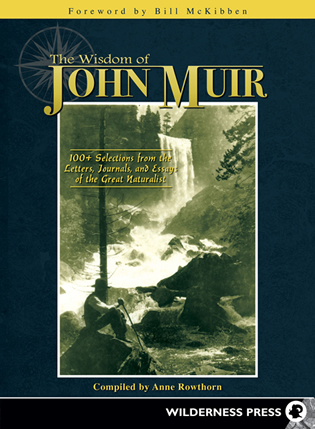 The Wisdom of John Muir is a compilation of more than 100 of Muir’s most evocative writings. As you read the stirring words of this iconic naturalist, you’ll feel the wildness of nature calling to you. Through Muir’s writings, you’ll experience the solace and beauty of a sugar pine forest, the adventure of one harrowing night spent on a glacier, and the wonder of the pristine Yosemite Valley and the Sierra Nevada Mountains before they were tainted by human intervention. For Muir, to be outdoors was to be home, where discovery and adventure awaited around each bend in the trail, and the creatures of the mountains, streams and sky were his friends. It is no wonder that John Muir became nature’s most powerful proponent, prompting President Theodore Roosevelt to create our national parks. Americans have John Muir to thank for one of our great treasures, our national parks. In The Wisdom of John Muir you will get to know the man behind the legend. Muir was one of those very rare Americans who changed the way we see the world. He helped free our minds, and our bodies—he was a liberationist par excellence, and the great wheeling freedom of his words shines through to this day. Pack a rucksack, grab an apple and a copy of this book, and go find someplace suitable to read it! John Muir was to draw many times on this image of his first sight of the Sierra Nevada. It was a view that shaped his thinking and sustained him all his days to come. Of his three-month-walk from San Francisco to this point, Muir wrote, “I followed the Diablo foothills along the San Jose Valley to Gilroy, thence over the Diablo Mountains to the Valley of the San Joaquin by the Pacheco Pass, thence down the valley opposite the mouth of the Merced River, thence across to San Joaquin, and up into the Sierra Nevada to the mammoth trees of Mariposa and the glorious Yosemite, thence down the Merced to this place.” The curtain was raised! The air was perfectly delicious, sweet enough for the breath of angels; every draught of it gave a separate and distinct piece of pleasure. I do not believe that Adam and Eve ever tasted better in their balmiest nook. The last of the Coast Range foothills were in near view all the way to Gilroy. Their union with the Valley is by curves and slopes of inimitable beauty, and they were robed with the greenest grass and richest light I ever beheld, and colored and shaded with millions of flowers of every hue, chiefly of purple and golden yellow; and hundreds of crystal rills joined songs with the larks, filling all the Valley with music like a sea, making it an Eden from end to end. The scenery, too, and all of Nature in the pass is fairly enchanting, strange and beautiful mountain ferns, low in the dark canyons and high upon the rocky, sunlit peaks, banks of blooming shrubs, and sprinklings and gatherings of flowers, precious and pure as ever enjoyed the sweets of a mountain home. And oh, what streams are there beaming, glancing, each with music of its own, singing as they go in the shadow and light, onward upon their lovely changing pathways to the sea; and hills rise over hills, and mountains over mountains, heaving, waving, swelling, in most glorious, overpowering, unreadable majesty; and when at last, stricken with faint like a crushed insect, you hope to escape from all the terrible grandeur of these mountain powers, other fountains, other oceans break forth before you, for there, in clear view, over heaps and rows of foot hills is laid a grand, smooth outspread plain, watered by a river, and another range of peaky snow-capped mountains a hundred miles in the distance. That plain is the valley of the San Joaquin, and those mountains are the great Sierra Nevadas. The valley of the San Joaquin is the floweriest piece of world I ever walked, one vast level, even flower-bed, a sheet of flowers, a smooth sea ruffled a little by the tree fringing of the river and here and there of smaller cross streams from the mountains…. John Muir Letters to a Friend Written to Mrs. Ezra S. Carr 1866-1879 (Boston and New York: Houghton Mifflin Company, 1915). Used by permission of Houghton Mifflin Harcourt. All rights reserved. There is the saying of an unknown Zen master, “Knock on the sky and listen to the sound.” John Muir knocked, listened, observed and took into the core of his being everything that was natural and beautiful. All his senses were awake; he was enfolded in nature’s grasp. Half cloudy, half sunny, clouds lustrous white. The tall pines crowded along the top of the Pilot Peak Ridge look like six-inch miniatures exquisitely outlined on the satiny sky….And so this memorable month ends, a stream of beauty unmeasured, no more to be sectioned off by almanac arithmetic than sun-radiance or the currents of seas and rivers—a peaceful, joyful stream of beauty. Every morning, arising from the death of sleep, the happy plants and all our fellow animal creatures great and small, and even the rocks, seemed to be shouting, “Awake, awake, rejoice, rejoice, come love us and join in our song. Come! Come!” Looking back through the stillness and romantic enchanting beauty and peace of the camp grove, this June seems the greatest of all the months of my life, the most truly, divinely free, boundless like eternity, immortal. Everything in it seems equally divine—one smooth, pure, wild glow of Heaven’s love, never to be blotted or blurred by anything past or to come. “Nature is a Good Mother,” comes from a well-known essay entitled, “Wild Wool,” first published as an article in the Overland Monthly in 1875. It is a statement of Muir’s conviction that the regular, untrammeled forces of nature are sufficient to provide for all her creatures—feathers for birds, hard shells for beetles, fur for bears, and that each creature is perfectly clothed for its niche in the environment. Even the squirrel, he says, wears socks and mittens and carries a broad furry tail to use as a blanket. Using the example of sheep Muir says that wild sheep, unlike their domestic cousins, have a thick undercoat that repels snow and rain. The purpose of the essay is to counter what Muir contended was, “…the barbarous notion [that]is almost universally entertained by civilized man, that there is in all the manufactures of Nature something essentially coarse which can and must be eradicated by human culture.” In a phrase, Nature knows best! Nature is a good mother, and sees well to the clothing of her many bairns [children]— birds with smoothly imprecated feathers, beetles with shining jackets, and bears with shaggy furs. In the tropical south, where the sun warms like a fire, they are allowed to go thinly clad; but in the snowy northland she takes care to clothe warmly. The squirrel has socks and mittens, and a tail broad enough for a blanket; the grouse is densely feathered down to the ends of his toes; and the wild sheep, besides his undergarment of fine wool, has a thick overcoat of hair that sheds off both the snow and the rain. Other provisions and adaptations in the dresses of animals, relating less to climate than to the more mechanical circumstances of life, are made with the same consummate skill that characterizes all the love work of Nature. Land, water, and air, jagged rocks, muddy ground, sand beds, forests, underbrush, grassy plains, etc., are considered in all their possible combinations while the clothing of her beautiful wildlings is preparing. No matter what the circumstances of their lives may be, she never allows them to go dirty or ragged. The mole, living always in the dark and in the dirt, is yet as clean as the otter or the wave-washed seal; and our wild sheep, wading in snow, roaming through bushes, and leaping among jagged storm-beaten cliffs, wears a dress so exquisitely adapted to its mountain life that it is always found as unruffled and stainless as a bird. Such is the power of words that when the essay, "Any Fool Can Destroy Tree," was first published, it was enough to lead President Grover Cleveland to establish thirteen forest reserves, comprising twenty-one million acres, and lay the foundation of the United States Forest Service. They are the final words in Muir’s second book, Our National Parks, published in 1901. By the time the book came out, John Muir had been acknowledged as the country's the most ardent defender of the American wilderness. The axe and saw are insanely busy, chips are flying thick as snowflakes, and every summer thousands of acres of priceless forests, with their underbrush, soil, springs, climate, scenery, and religion, are vanishing away in clouds of smoke…. Any fool can destroy trees. They cannot run away; and if they could, they would still be destroyed —chased and hunted down as long as fun or a dollar could be got out of their bark hides, branching horns, or magnificent bole backbones. Few that fell trees plant them; nor would planting avail much towards getting back anything like the noble primeval forests. During a lifetime only saplings can be grown, in the place of the old trees —tens of centuries old —that have been destroyed. It took more than three thousand years to make some of the trees of these Western woods —trees that are still standing in perfect strength and beauty —waving and singing in the mighty forests of the Sierra. Through all the wonderful, eventful centuries since Christ's time —and long before that —God has cared for these trees, saved them from drought, disease, avalanches, and a thousand straining, leveling tempests and floods; but he cannot save them from sawmills and fools…. Walk away quietly in any direction and taste the freedom of the mountaineer. Camp out among the grass and gentians of glacier meadows, in craggy garden nooks full of Nature's darlings. Climb the mountains and get their good tidings. Nature's peace will flow into you as sunshine flows into trees. The winds will blow their own freshness into you, and the storms their energy, while cares will drop off like autumn leaves. As age comes on, one source of enjoyment after another is closed, but Nature's sources never fail. Like a generous host, she offers here brimming cups in endless variety, served in a grand hall, the sky its ceiling, the mountains its walls, decorated with glorious paintings and enlivened with bands of music ever playing. The petty discomforts that beset the awkward guest, the unskilled camper, are quickly forgotten, while all that is precious remains. Fears vanish as soon as one is fairly free in the wilderness.